This post has been created to show you (i) how to remove Naampa ransomware virus from your computer and (ii) how to restore .crptd files. A ransomware virus, known as Naampa ransomware has been spotted to encrypt important files in the computers it infects, adding the .crptd file extension after their file names. The virus aims to drop it’s ransom note, named !—-README—-!.jpg which notifies the victims that their files are encrypted via RSA-2048 encryption algorithm and they must contact the crooks via TOR browser and make a ransom payment in return for their files. If you have become an unfortunate victim of the .crptd file virus, we advise reading the following material. Short Description Encrypts the files on your computer possibly with RSA-2048 and then demands a ransom payoff to get them back. Symptoms Files are encrypted with an added .crptd file extension to them. A ransom note, named !—-README—-!.jpg Is added to the infected computer. User Experience Join Our Forum to Discuss .crptd. The primary infection method of viruses like the Naampa .crptd ransomware is via e-mail. Since this virus is primarily written in Russian language, the cyber-criminals may have targeted widely used e-mail providers such as mail.ru accounts. 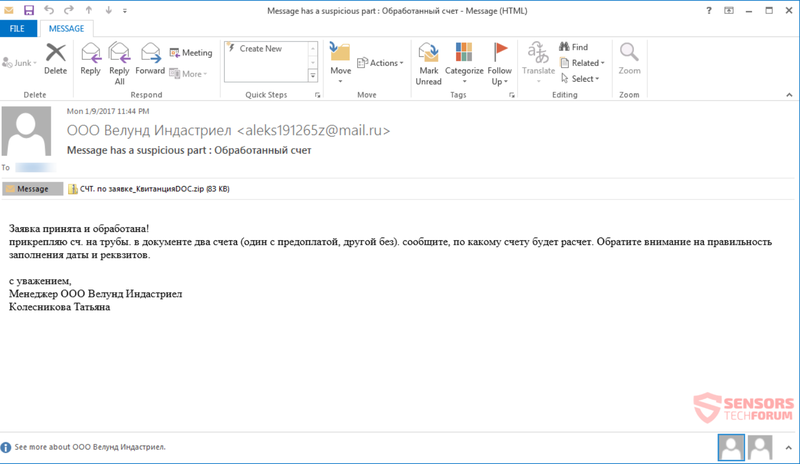 The spam messages distributing the .crptd virus may have e-mail attachments which aim for one thing and one thing only – to trick you into opening the attachment. Besides this main method by which over 80% of ransomware viruses are spread, the Naampa virus may also exist in an uploaded form on suspicious websites. It may pose as a fake setup, fraudulent system update, fake game crack or program activator, etc. This command may not be noticed by the victim and it may also be accompanied by other commands that may disable system recovery as well as shut down Windows Backup Service. “Your files are encrypted using the RSA-2048 algorithm. n3r2kuzhw2h7x6j5.onion – there will be specified a valid mailbox. For the encryption process, the .crptd file virus claims to use RSA-2048 encryption algorithm, which is a strong and stable cipher and it’s core competence is that it generates set of private and public decryption key. Each of the keys the .crptd ransomware has generated is unique, meaning that if there is no decryption flaw which can allow for researchers to discover a master key, it may take years to get your files restored back to normal. If you are a victim of the .crptd file virus, we advise you to go ahead and backup all your encrypted files for if a decrypter is released in the future. Then you can proceed to contain the damage done by this infection by removing it. This is achievable by following the removal instructions for .crptd file virus below. They are specifically designed to help you delete this virus either manually or automatically. Since the .crptd file virus tampers with key components of Windows, we recommend users to download and install the proper anti-malware software to fully remove the .crptd ransomware from your computer. After the virus has been removed, to help you restore as many files as you can, we have designed alternative instructions under the name “Restore files encrypted by .crptd File Virus” below. They are some indirect methods with which you can recover at least some of your files. But make sure to first make a backup and try them at your own risk with copies of your files. Threats such as .crptd may be persistent. They tend to re-appear if not fully deleted. A malware removal tool like Combo Cleaner will help you to remove malicious programs, saving you the time and the struggle of tracking down numerous malicious files. Threats such as .crptd may be persistent on your system. They tend to re-appear if not fully deleted. A malware removal tool like SpyHunter will help you to remove malicious programs, saving you the time and the struggle of tracking down numerous malicious files. Note! Your computer system may be affected by .crptd and other threats. SpyHunter is a powerful malware removal tool designed to help users with in-depth system security analysis, detection and removal of threats such as .crptd. 1. Install SpyHunter to scan for .crptd and remove them. 2. Scan with SpyHunter, Detect and Remove .crptd. Ransomware infections and .crptd aim to encrypt your files using an encryption algorithm which may be very difficult to decrypt. This is why we have suggested several alternative methods that may help you go around direct decryption and try to restore your files. Bear in mind that these methods may not be 100% effective but may also help you a little or a lot in different situations. Note! Your computer system may be affected by .crptd or other threats. Remove .crptd by cleaning your Browser and Registry. Fix registry entries created by .crptd on your PC. Combo Cleaner is a powerful malware removal tool designed to help users with in-depth system security analysis, detection and removal of threats such as .crptd. Step 5: In the Applications menu, look for any suspicious app or an app with a name, similar or identical to .crptd. If you find it, right-click on the app and select “Move to Trash”. Step 6: Select Accounts, after which click on the Login Items preference. Your Mac will then show you a list of items that start automatically when you log in. Look for any suspicious apps identical or similar to .crptd. Check the app you want to stop from running automatically and then select on the Minus (“–“) icon to hide it. Remove .crptd – related extensions from your Mac’s browsers. A pop-up window will appear asking for confirmation to uninstall the extension. Select ‘Uninstall’ again, and the .crptd will be removed. When you are facing problems on your Mac as a result of unwanted scripts and programs such as .crptd, the recommended way of eliminating the threat is by using an anti-malware program. Combo Cleaner offers advanced security features along with other modules that will improve your Mac’s security and protect it in the future. Hey !, I found this information for you: ".crptd File Virus – Remove and Restore Files". Here is the website link: https://sensorstechforum.com/crptd-file-virus-remove-restore-files/. Thank you.